LSI strongly believes that we in industry are all responsible for training our next generation of technical talent. It is no secret that America has lost manufacturing jobs, nor is it a secret that the amount of engineers entering the manufacturing sector has dwindled. In several discussions I have had with local universities, even the engineering disciplines have seen a reduction in enrollees over the last 20 years. We must all work to change this and to make America a leading producer of engineers and to continue to be innovative. America is still strong in manufacturing, much to many people’s surprise, but we have to be smart about what we produce and we have to use automation to lower costs of manufactured goods and to make better quality products. China and Mexico have taken much of the labor intensive, low cost manufacturing jobs. However, America still outpaces them both in manufacturing output in raw dollars because we are still able to produce higher dollar products much more efficiently and at a better quality. This trend needs to not only continue, but accelerate. Helping schools draw more engineering talent into their programs, and getting more top talent into manufacturing will help us as a country achieve this. LSI is investigating more and better ways to work with the local universities to help in this manner and this conference is one step in this process. Many people do not realize that LSI works prevalently in quality control systems for the air conditioning and refrigeration business; nor do people realize that LSI has significant mechanical design and mechanical installation management capability. This blog highlights how these two groups of engineers worked with a customer to move manufacturing capacity from one site to another. 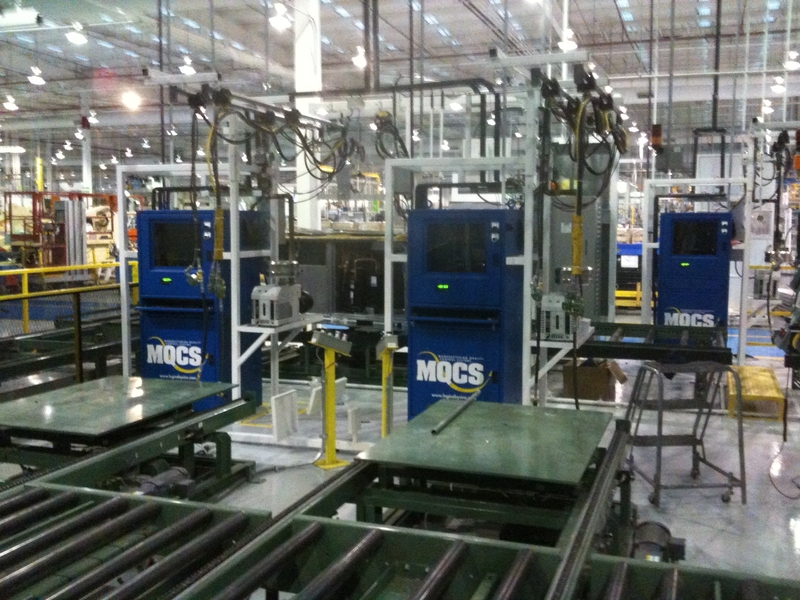 LSI has been working with a major air conditioning manufacturer for many years in doing manufacturing quality control systems and had used LSI’s” MQCS” product in many applications. You can learn more about MQCS here. This manufacturer is moving some manufacturing from a current US site to a site in Mexico and asked LSI for assistance. 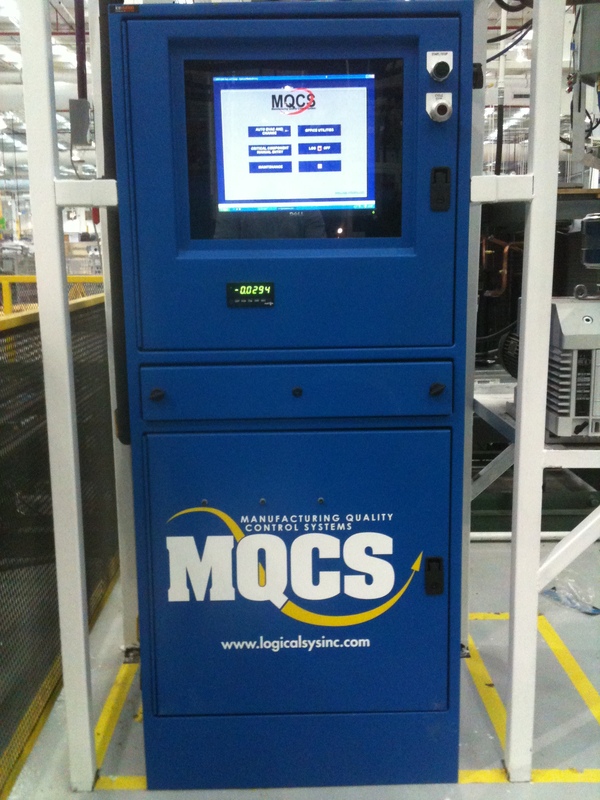 LSI had already built charge equipment and implemented MQCS software for the US plant. LSI was able to perform this project ahead of schedule and under budget. The customer actually was able to make a pilot run on this line in 80% of the time allotted and the line is scheduled to be online sooner than expected. The customer has committed to further work with LSI as a result of this successful project, which includes the 4 additional lines’ relocation to Mexico and the interface of the MQCS software to SAP; which is being rolled out in multiple locations. You can always catch the latest news about LSI, as well as other updates LSI has published recently here: http://www.logicalsysinc.com/latest-news. Just last week, LSI helped celebrate the grand opening of Riviana Foods’ new 431,000 square foot plant in Memphis (see the article on the grand opening here). You can also read more about the grand opening here. Riviana broke ground in February 2008, and invested approximately $70MM in the plant and has created over 200 jobs for the Memphis community. The company also announced last week that a new microwavable product will be made in the Memphis plant. This will be an additional $12M investment and an additional 22 jobs will be created. This product is currently produced in Spain by Riviana’s parent company, Ebro Puleva Foods. The company also notes that there is excess space to add more production capacity to the Memphis facility as it becomes necessary. Other brands under the Riviana/Ebro Puleva include New World Pasta. LSI was thanked at the celebration for being a part of the success. LSI strongly believes that Riviana is great for Memphis and we are looking forward to working with them for years to come! For more information on LSI, click here. LSI has been working with a client who has a remote location in the middle of the panhandle of Texas for the past 2 ½ years. This client has a custom batch process that has enjoyed continued growth over the last few years (astronomical at times) which keeps us constantly challenged to keep up with their process. Several times over the last few years, business opportunities (new customers for our client) has challenged LSI to enhance the process, re-write major core chunks of the application to fit the new needs, or add additional equipment to support the process. The major challenge is that the core code in the PLC was written long before LSI became a part of the team, and was written for an entirely different process and business model. The client has grown from a single product (all with 1 ingredient or slight variations with the 1 ingredient that corrected the dry matter consistency of the product) that was run almost continuously to a highly customized batch solution as now almost one-half to two-thirds of the batches are customized with multiple ingredients. There are several things that LSI has learned through the last two and a half years that can help our clients make their own process better and we would like to share those experiences in this post. About a year and a half ago, we were challenged to make batches that have a tighter tolerance in their main ingredient. The goal was to have 95% plus batches have a +/-1000 pound tolerance for the main ingredient in a 56,000 – 57,000 pound load; and for 90% of the batches to have a +/-500 pound tolerance. The main ingredient makes up between 60% and 100% of the batch. The customer also had a goal of increasing the speed of the fill for the main ingredient. At that time, 2,000 to 2,500 pound swings in either direction for final weight to target of the main ingredient weight were not uncommon. This had not been a major problem for a single ingredient batch that ran almost 100% of the time, but it did cause manual intervention at times and was certainly seen as a hindrance to the goal of doing more blended loads that had multiple ingredients. The customer didn’t want to have to make adjustments to the batch’s individual ingredients after the mixer was filled to keep the entire batch in specification, as it would slow down the process and potentially lead to human error. The constraint that made this goal very difficult to attain was the fact that the feed rate for the main ingredient is highly variable during a batch (0-50,000 pounds per minute) and is difficult/impossible to make constant. So, LSI wrote a very simple algorithm that slowed down the fill rate at the end of the batch that allowed for approximately 97% of the loads to be within 1,000 pounds, approximately 90% were within 500 pounds of the target fill, and about 65% were within 250 pounds of the target fill. This was a huge improvement and allowed our client to land a new customer. However, now the client needs even more of the loads to be within the 500 pound specification because of requirements from another new client and because of some extremely tight tolerances on some ingredients. Some of these ingredients will be less than 100 pounds of the entire batch, so if the main ingredient gets way out of specification, then the entire load can be out of specification. 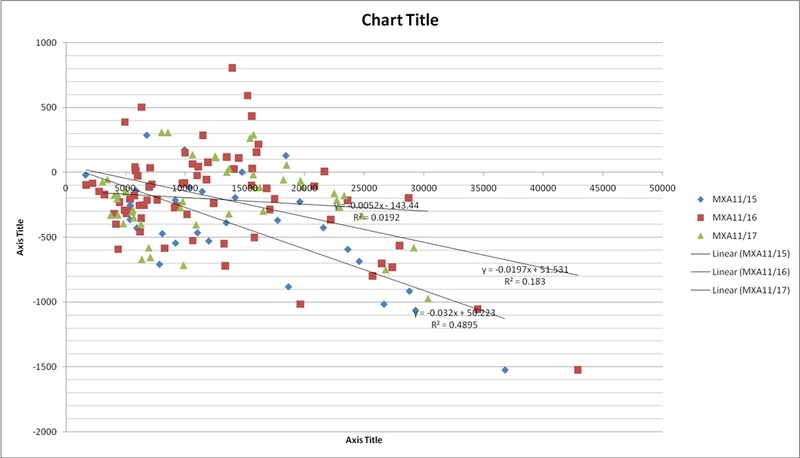 So, LSI has started using the plant’s data historian, which was unavailable at the time of writing the above algorithm, to analyze why there are still some overshoots or undershoots in the process and this data gathering and reporting is allowing LSI to “tune” the algorithm used to get the accuracy needed. Feed rate at the end of the fill cycle is being correlated to overshoot or undershoot values. If the feed rate is below a certain value, accuracy within 250 pounds is nearly guaranteed. Outside of this rate, the results are more variable. LSI is now noticing that the plant is achieving feed rates much higher during the filling process than when the algorithm was first written, and because of this, these “golden” feed rates at the end of the batch are not being achieved as often. LSI is using a formatted spreadsheet report to identify batches out of tolerance (each have a time and date stamp of when the batch ended), then is using trends of key data during the batch (feed rates, mixer weights, current of motors, cutoffs of equipment, etc.) to analyze the process data on why the “golden” feed rates were not achieved and why the batch went out of tolerance. LSI has been able to tune the algorithms for more repeatable performance. For a recent 38 hour period, 349 batches were run with 99.7% of the tolerances for the main ingredient being under 1,000 pounds (1 batch), 96% were under 500 pounds, and 75% were under 250 pounds. Without the correlation provided by the historical data and trends, then this tuning would not have been possible. Figure 2 - Scatter plot showing improvements in accuracy over a 3 day period. Figure 3 - Mixer trend - Light blue line shows ingredient 1 target, pink shows ingredient 1 actual, green is overall mixer weight, and dark blue shows the feed rate into the mixer. 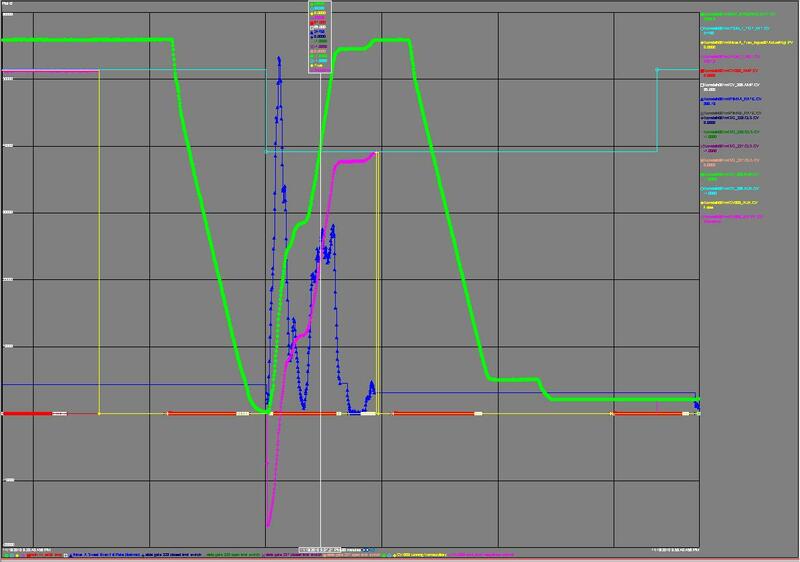 Being able to correlate data from a process historian has allowed LSI to become the “process engineer” and optimize the process itself through the PLC code. Many companies collect all kinds of data, but to be able to actually act on the data being supplied is the real value of having the data in the first place. The company must also have intelligence within its own ranks or within its partner network to actually act on the data and make the improvements needed. This has to be done by people who understand the process. Without intimate process knowledge, the data really has limited value. LSI will be working with this client in the future to put together more reports that will allow them and us to find opportunities to optimize the manufacturing process itself and/or the operator’s work flow as well. We will also be looking for lost opportunities in revenue(i.e. if the truck scale was empty too long, meaning that there was no truck to fill to send to a customer – as this may point to issues within the customer’s own supply chain). I am sure the customer will continue to challenge us to further improve and optimize the process. Collecting data for the sake of collecting data is useless. 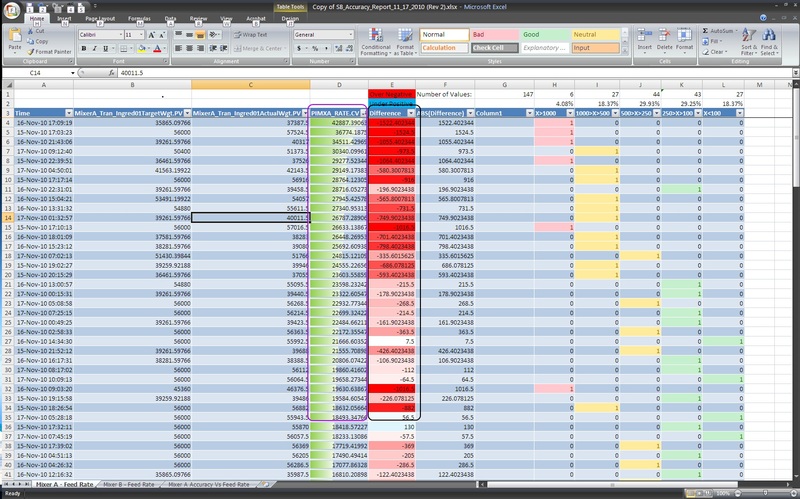 Putting the data to work in optimizing the process or work flow is priceless. I recently made my second trip to the People’s Republic of China and I must admit that it is always an educational experience for me. The culture, as you can imagine, is very different there. Guangzhou, where our office is located, is a city of 10.3 million people (China’s 3rd largest city behind Beijing and Shanghai), which is just over 2 million more people than New York City, which is by far the largest city in the US. It is striking to note that China has 3 times the population of the US, yet has only about half the livable land. So, China is very crowded, and there is a large separation between classes of people. The middle class is emerging, but it is not like what we enjoy in the US. The manufacturing culture is also very different. Some factories have living quarters on site (it is not uncommon for a husband to live at the plant site and only see his wife once every few months), other bus people in and out, and many use a bike, moped, or scooter to get to work. Very rarely do plants try to work with as few people as necessary as we do in the US, because they seem to want to keep people employed, and labor is still cheap in China, although this is changing. I have visited factories where we would have 5 people to perform a task, and they would have 20. I highly suspect that as this middle class emerges and the Chinese become more savvy when it comes to automation, that this will change as well. To digress for a moment, it is an interesting story on how we even ended up in China. Larry Bailey, our founder and CEO, knew the day was coming because customers would not continue to support LSI executing projects in China in which 30% of the budget was travel. We had worked for several multi-national clients and it was becoming apparent that our cost structure was becoming a hindrance to execute more projects. So, Larry began the search for the right person and the right opportunity. I must admit that Larry did his homework and had great insight into the culture there before starting an operation over there. One thing that is of great value in China is family. The Chinese people are extremely loyal to families, and not always to companies. He had to find someone who felt a part of the LSI family and someone who takes much pride in his or her work. The right man for the job came along in 2003. Hansen Hu, China branch manager, spent two years in the US with his family learning our country’s culture, the company culture, he came to understand “western quality,” and most importantly, he became a part of LSI’s family. In 2005, Hansen started the Guangzhou operations, which now employs 9 people. On my two trips to China, I have truly started to understand our value over there. We have several people now who not only are technically capable, but they understand and can speak good English (read and write), and they certainly understand the culture in China. I went on a sales call with Hansen at a process plant just outside of Guangzhou in Nansha. The call was on a US engineer who will be spending the next 5 years in Nansha, along with some of the Chinese staff at the plant. I simply gave a presentation on LSI’s DCS capabilities and our experience with his particular process. However, it hit me as we were walking to lunch as I watched Hansen walk ahead of us, talking with the Chinese process engineer, REALLY what our value was. I told the American engineer as we were walking, what I saw was our value – I stated “we have a guy who speaks English, speaks Chinese, understands both cultures, AND he knows the technology.” The customer recognized this as he made the statement (with a chuckle) “yeah he can talk with my engineers to find out what is really going on around here.” What I didn’t realize until the next day is that we have more than one person who is like this in our China office. Hansen has several capable engineers who have delivered results to US based clients. I have spoken with these customers, and they have been extremely pleased with our engineers’ work over there. We have just sent one of our engineers, Mark Anderson, from the US to support this first DCS project in China at the plant I mentioned above in Nansha. This will greatly enhance our skill set in China and will also add to our client list. I am confident that I will get a good report on his return. Other capabilities that we have in China are drafting, programming, panel fabrication, project management, and electrical installation management and execution. One other great value that we bring to a customer in China is that we have connections on how to get things done over there. We have learned much in our 10 plus years of doing business and our 5 plus years of being on the ground over there. For instance, we understand how to import parts into country if needed (no small feat), how to get electrical installations completed with “western quality” (again, no small feat), and we can certainly consult with any customer on how to execute projects in China or anywhere else in Asia, as we have been there and made the mistakes that many make the first, second, or even third project in the region. I will never forget a call from a panicked customer who asked me if Hansen could help them get a control panel into country as theirs had been flagged in customs for not being CCC (the Chinese UL essentially) compliant. Unfortunately, it was too late for us to help that situation, but we did rebuild the panel for them in China. Once the flagged panel showed back up in the US, we stripped it for spares and sent the parts back to China for the client. In 2009, on the largest project that LSI has executed in its history, the China office helped LSI get 1100 drawings completed in 6 weeks, as we were literally working on drawings for 24 hours a day for weeks on end. The US would mark up drawings to send to China, and the guys in the China office would make the edits and have them back in our engineer’s inbox when they came in to work in the morning. We would not have been successful without Hansen and crew. I must admit that if I hadn’t gone to visit Hansen and his people, I am not sure I would have the true appreciation for what they can bring to a multi-national client. I am thoroughly convinced that we have yet to scratch the surface of what value we can deliver in China. I am excited to see the business grow each time I visit. LSI launches a Social Media campaign…. So, over the course of the next few days I saw how things like Blogs, YouTube, Flickr, Facebook, Twitter, LinkedIn, and Slideshare could help LSI. I had really felt challenged to really tell our story – the way we can in front of a customer. I thought about how when I put together a presentation on the massive DCS projects that we have completed, or show a customer all of the great work we do in our panel shops, and how positive the response is; I kept wondering to myself how I could get these stories out to our customers and potential customers. I passionately believe in our people and I see the complex problems we solve every day. Just last month, we implemented a PLC/HMI program change at a customer site in Texas that allows them to produce 30% more product, which opens the door for them to add more capacity and capability (along with many more customers), which then opens the door for plant expansion as the word gets out at what they can produce. What a great story!! Yet, only a select few people in or outside of our company even knows about it (until now). Why should we not be telling our story?? Hence, this is why this blog is started. I would be curious as to what YOU want to hear about as this has to be of value to the audience mentioned above. If it isn’t valuable, you won’t read it. So if you have suggestions, please let me know.